I love strollers. I mean really, really love them. I have owned many strollers over the past six years and firmly believe there is no one perfect stroller. From luxury to running to travel/umbrella, there is a stroller for every one yet there is no one stroller that can do it all. That being said, the newer strollers on the market are making headway towards being the one and only. Enter Mamas & Papas, a company popular in the UK that is newer to the North American market. 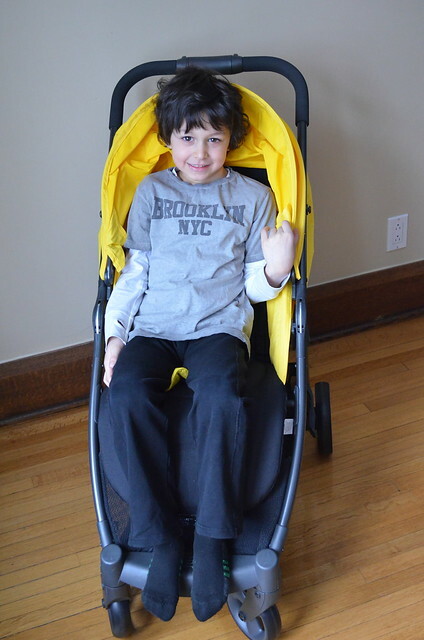 Their stroller line includes a number of options including the Armadillo, which they call the “Big Little Stroller”. I love a one handed fold. The easier the better! Especially if you are holding a baby and only have one hand to use. The Armadillo does feature a one handed fold. It is quite different from most other folding mechanisms I have seen before in that you press a button and turn a piece on the handlebar (all with one hand) and simply fold the stroller forward. It is very easy to do once you figure it out. I would caution, however, that it is geared for right handed folks and I could see that lefties could possibly find it tricky. To unfold you simply unlock the stroller and pull it open. Super easy. The seat on the stroller is very plush and quite roomy for a stroller of this size. The leg rest is adjustable, which is great for those using the stroller with younger babies and very easy to use (also one handed). The canopy is huge and features a peekaboo window with a magnetic closure, which may not seem like a big deal but there is nothing worse than trying to check on babe and having to rip Velcro open to do so and waking them up. The straps have three height options and the adjustment is a standard thread through design. The safety buckle is a puzzle piece design, which many people find a bit of a hassle but I actually found this particular one very easy to do up and even easier to undo as both pieces popped out on release. My infant fit with tons of room of course, but my very tall kindergartener was also able to sit in the stroller with not much room to spare. I’m not concerned about this since he would only need to sit in it in a pinch or an emergency situation, but this indicates that this stroller would easily accommodate a very large and/or very tall toddler without any issue. The recline on the stroller is probably the only thing I didn’t love about this stroller. While the recline is one handed, you do need to pull down quite firmly as it is controlled with a strap mechanism, which in turn means that in order to restore the seat to the upright position, you need to use two hands. I also didn’t find the recline to be fully flat as advertised; however, my very young infant was able to lie pretty comfortably and would be able to nap without much of an issue. The brake on the stroller is one small push pedal and can be activated with very little pressure on both the breaking and release, which makes it pedicure friendly. I know, it’s not a car but sometimes it sure feels like shopping for one. The ride on this stroller was very smooth with both my little and big kid, which is a huge plus. If you have a stroller that bumps and rattles along you aren’t going to use it. The front wheels can be locked or set to swivel depending on your terrain, which is helpful for city life and walks at the park. The Armadillo has a great ride especially for a stroller in its size category and even more so in its price range. If you are a pack mule mom like me you probably care about the size of the under-carriage basket. While it isn’t quite large enough for a big diaper bag, it certainly would carry the essentials. The Armadillo is a fantastic option for those looking for a compact and lightweight (under 18 lbs) stroller with luxury features and a very reasonable price point. 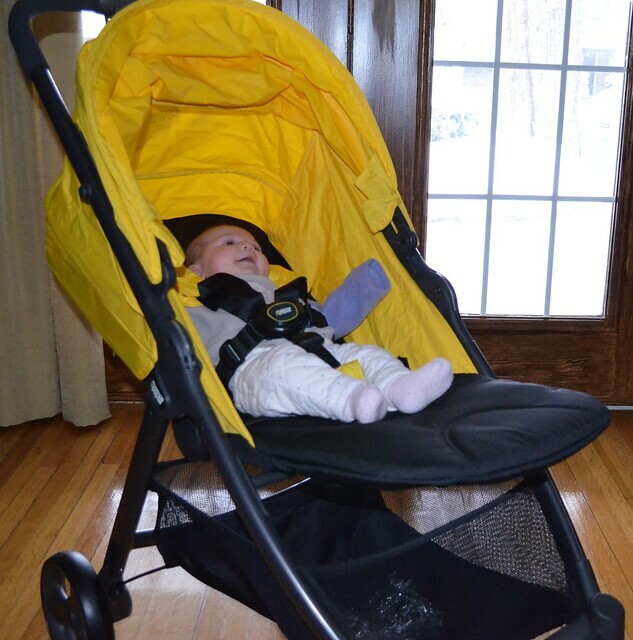 The Armadillo features a 50 pound weight limit and can be used from newborn stage. 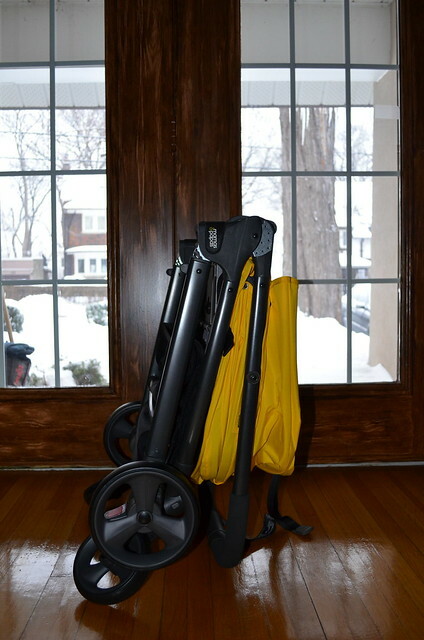 A rain cover is included with the stroller and an adaptor can be purchased separately and used with an infant car seat to create a full travel system. With an MSRP of $289.99 CDN this stroller is a lot of bang for your buck. 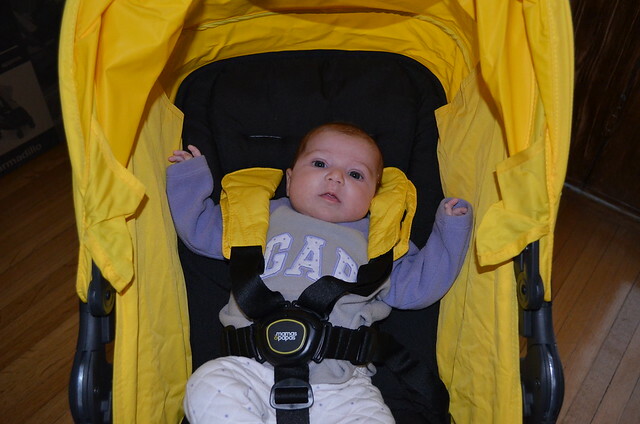 The Armadillo is available at Babies R Us and comes in Black, Indigo and Lemon Drop (shown here). WIN IT: One lucky Canadian reader will win one Armadillo stroller from Mamas & Papas (Lemon Drop). Enter to WIN via Rafflecopter below. Good Luck! Besides the strollers I’d love to try their baby bud seat. I’d like to try the baby bud for when we go out to eat with baby. I really like the Loop Highchair in green. The Armadillo stroller is pretty nice to. I have 3 kids under 5 so I would get some good use out of it. I love a light weight stroller, makes shopping and going for walk easy. I find it hard to maneuver those heavy over sized strollers. Great review and thanks for the chance. I’m pretty smitten with the Armadillo stroller. I have the summer 3D but the one handed fold would be awesome especially with a wiggly toddler. This stroller looks amazing! Would be great for the little one we’re expecting and for our toddler too. I’d love to try the Loop Highchair! I like the look of the Go Eat High chair! Under the apple tree playmat is adorable, the pixi highchair,and the morph baby carriers are awesome too. I also love the Morph Baby Carrier M/L Harness in Plum Pudding! Great toys on the site – love the Tummy Time Activity Toy. Well, aside from this awesome stroller, or any of their other strollers, I would also love to try the Go Eat High Chair. I think it would fit nicely in our dining area. I’d love to have the Magic Stargaze. Very interactive and personable. I love the loop highchair! I would love to try the Loop Highchair – and of course any of their beautiful strollers! The Go Eat High Chair is nice! would love to try the loop highchair! I love the Loop Highchair, very stylish and the colors are really vibrant. I like the Under the Apple Tree Playmat. I like the Go Eat Highchair. I would also love to try their Globe Magic bouncer. The baby snug seat is really cute! Btw, I really like this Armadillo stroller, so classic and cute. I would like to try the Loop Highchair! Magic Stargaze playmat , how cute and fun ! Loop Highchair is a fantastic item I would love to own! I like the Apollo Bouncer! I would love the Loop Highchair in White/Lime and the Baby Snug and Tray in Plum. I love the Pixi highchair. I would really like to try the Go Eat Highchair. The universal high chair play tray is awesome! I would love to try the Loop Highchair in the colour black. What a great looking chair. I’d like to also try the PLAYMAT & GYM OCTOPUS. I would like the Bouncer in the wine colour! gorgeous. I would also love to try the CLASSIC CARRIER in red. 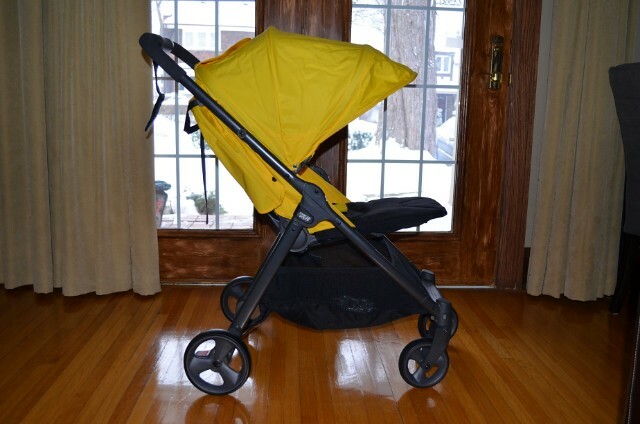 Besides this stroller, I think the Morph Raincover baby carrier will come in handy when we have our 2nd baby! I would like to try the Apollo Bouncer. I would like the armadillo stroller. I’d love their Loop Highchair. i like the The Mamas & Papas MAGIC Globe Rocker love the raspberry color! The Mylo Package would be interesting to try. Their babysnug with play tray in Plum is another product that caught my eye for my baby girl! Totally loving the Baby Snug with the play tray attached. That would be my pic for sure. Love it! This would be a great stroller for me to use for my grandchildren. Easy, lightweight = perfect. Would love to try the Globe Magic bouncer. I’d like to try the Baby Bud. I really like the Pixi Highchair. Thanks! I would like to try the Pixi Highchair. Just the best baby ride around. I would love to try the classic carrier too. The Armadillo Stroller looks so versatile. I Like the Urbo2 in Teal! I like the loop high chair. The Loop Highchair looks pretty awesome. I like the Snug seat. I heard it was good for cloth diapered babies. I would love any of their strollers but my youngest is 2 so we wouldn’t have any use for any of their other products. It would be nice to wear him in one of those backpack carriers but I think he Is too heavy for them. I really like the Astro Magic – very retro and cool looking. The Astro Magic Bouncer is so cool! I could see my grandson getting many hours of enjoyment! Would love to try the baby bud with my little one! As a first time mom-to-be, winning this beautiful stroller would be awesome!! I love the way it looks and of course the functionality. I also love the look and ease of the Go Eat Highchair! We are definitely short on space as we live in an apartment so this would be a great buy for us! love the Loop high chair! i would like the baby snug for baby J.
I would like to try their Juice high chair. How cool is the is highchair, loop . I love the tour stroller to but this highchair is killer . I love the all black one . I like the baby bud chair. I would love to have the tour stroller. I LOVE the Mamas & Papas Baby Snug, so I’m sure I would also love the Armadillo stroller. I’d like to try the Light & Sound Lotty Playmat. It looks very engaging for a baby. This stroller looks amazing! Would be great for the little one we’re expecting and for our toddler too…. I checked out their site and i really like the Pixi in Apple. Both colours are nice, but I like the apple better. I love the Loop Highchair! It looks comfy and the lime green color is awesome. I’d like to add a 3 wheel stroller so the Sport Stroller in Red/Black. I product that I would like to try from Mamas and Papas is the Astro Magic bouncer. Magic stargaze playmat is very cute! I like the Loop highchair! So cute! I would love to try lots of their products! Other than the strollers, I would say I would love to try the Loop Highchair. I would like to try the Urbo stroller. Looks like a great stroller. For both my 2 year old and new born. I would like to try the Juice high chair. It looks really stylish. The playmat and gym octopus has a great shape for little ones! They blended good functional pieces together to make a really cute mat. I really like the Pixi Highchair. I like the PLAYMAT & GYM OCTOPUS. I would like the Go Eat Highchair so I’d have it handy when Gabriel is over, but it would tuck away when he’s not. I like the Playmat and gym octopus. love to try their baby bud seat! I’d love to try the Loop highchair.